Gmail, Adwords, Analytics, Google+, Places, Images and Videos are only a handful of services Google offers the business world. Small and yet successful businesses have long used these tools to further succeed in their ventures. But Google also poses a big challenge for everyone who wants to gain business from them. It’s way too complicated. Google adds new services way too often- sometimes faster than business owners can learn about them. Yet, many of its important features, such as its standard search, change drastically over time, making it difficult for companies to stay up to speed. Even JC Penny and Walmart couldn’t predict Google’s behavior and lost a great deal of business as a result. One way to approach this obstacle is to identify which of these services is vital to your business and use it to your advantage. Without a doubt, Google Places (combined with organic SEO) is the most important for small businesses. Why? Because if your site is among the top five listings on Google Places, your customers will find you. It won’t matter if you don’t know how to use Adwords, Analytics, or Google+. Being seen at the top of search results is equivalent to purchasing a large, eye-catching ad in your local Yellow Pages that everyone owned 10 years ago. If your ad was the first, your phone would not stop ringing. If your business is listed high on Google Places, you will witness firsthand Google’s power to send customers your way. In a survey we performed, our clients that appeared on Google Places showed an increase of $45,000-to $274,000 in their annual revenue compared with when they didn’t show up on Google Places. On average, they spent just a small fraction of that money promoting their site. No other advertising method can beat that. Now, the question is how to get on Google Places. Or, if you are already there, then how do you improve your rank to reach that number one spot? If you are not listed, the first thing you ought to do is register your business with Google. 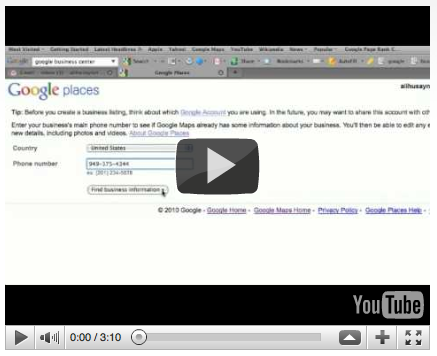 The steps are simple and are explained in this video: how to get on Google Places. 1- Get your customers to write positive reviews for you on your Google Places page. If they search for your business name along with the city you are listed under in Google Maps and then click on the letter associated with your business, a window will open at the top of your listing on the map that has a rating stars link. Clicking on the rating stars will get you to the reviews page. If you don’t have any reviews yet, then there will be a “write a review” link in this window. 2- Add the +1 button to your site’s pages and encourage your friends, family and customers to +1 your site. This will improve your site’s ranking on Google (for those who +1’ed your site’s page and those in their Google+ circles). 3- Improve your site’s link popularity. This means running a campaign that gets you natural, quality links from related Web sites. Since this is going to be the most important factor in helping you rank better on Google Places, I’ll explain it in greater depth in an upcoming article. Keep your questions in mind and stay tuned. I am impressed with this article. My site is now on a back page so that\’s why I want to improve my site in Google. Does this hurt our ranking in Google Places? WOW !!!! NICE QUESTION, WANT TO KNOW THE ANSWER…………..
you are saying and the way in which you say it. You make it entertaining and you still care for to keep it sensible. I can\’t wait to read much more from you. This is actually a terrific website. Thanks for this advise! it’s very good but how can i start sending traffic to my blog? I t can give better result to search very easily and more catchy to the users; with the help of local listing we listed our business website as locally. It also improves our growth in ranking result. Google Should rank higher the websites of actual services providers than the yellow pages culture who charge and take away our hard earned money just by listing with the portals and charge even for a cold inquiry. Google places absolutely promoted my business! Everything you said in this post is true! It really helps your site! Is there any link between Google places and Google plus? if you are a active user on Google plus those it help you with Google place? Can Google workout a proper key word respond for a website optimization for local products and services . whenever you put a search word to search engine the page presents website and services that are really is far away to supply the product or services. please help me i have just started blogging. how can i start sending traffic to my blog? How to get on top of Google places. is there priority or seniority? I have felt the Penumbra of the Google success e without even investing / putting money in it . Maybe maintaining the adwords account is costlier the way it picks your money with every click prospective or just a cold ,but if you restrict your presence/ preference to your will or your zonal preference ,the earning is more than the expenses incurred . If u don’t have money there are still ways In THE Great Google ways like blogging etc. But…..yes like The truth always prevails , one need to have a quality powerful blog writing to attract viewers . Have a nectar property effect to attract bees to flower ( your blog) by powerful words. Keep the ethics of truth in your business, the people follow it , but fight the world with special efforts and patience to live the truth.. I Can feel the penumbra of success through the Google Noble ways . Thank you Google you better exhibit/generate huuuoooooooooooooooo effect in my heart than ya………………………………. can’t think of any thing other than GOOGLE. Have you found that Google Places produces much more traffic when compared to yellowpages and yelp? I am trying to decide whether it is worth listings in other directories such as YP and Yelp. Does anyone have experience comparing the two? Its always good to ask for a review for your Yelp or Google places account when finishing projects and successful endeavors with clients. Builds your reputation and improves the ranking ability of your profiles. I joined millionairium two weeks ago and my page rank has been increased in just 15 days thank you millionairium. Interesting statistics and a nice piece of advice. Are you planning to issue a case study on the client\’s increased revenue? It would be truly interesting. Clients don\’t usually want to publicly share that info. Good advice Andy… thanks for your contribution. Sure you can share it… Just make sure you link back to this page. You are right… And very good question. I\’ll post another article either today or tomorrow with emphasis on link-building and site popularity. This is a serious problem. I hope they get it resolved soon. At the same time, you should be able to rank well using organic SEO even without your Google Places. It\’s a bit more costly, but doable. This is very nice information and thanks ali. i receive your mail for this article and i am very happy to read this article and once thanks for your mailing for this info. Good advice….. \”Places\” is very underrated these days as people don\’t really see it as a major contributor to their overall traffic data, one major reason is that they don\’t track their places page, so they only see grouped traffic stats from Google search/organic in their analytics report. However, it is possible to manual tag your places page if you use the URL builder and add the specific source and medium in. Another way to ensure that your listings are ranking as high as possible is to make sure your places data is filled to 100% and also look to apply some localized SEO elements to your website…. putting area keywords your targetting in your site’s content and in the meta title and description can aid your quest, as the newer version of places shows it as a normal search engine listing which picks up on these factors. How it can improve our site’s popularity ? Because to my knowledge once installed on my blog is not a significant change. Are all these changes must be made with pay? No doubt about advantages of Google Places. I have experienced that with my listing. Thank god it was long ago and got a PIN for confirmation on phone. But now? It is worst. I am in India and chances of winning a lottery are more than getting listed in Google Places. In India you do not get the confirmation PIN on phone (perhaps this service was stopped, don\’t know why), but by ordinary Post. It is more likely that you will win a lottery than get the PIN through post. I added listings in my account and waiting to get the PIN. After waiting for 3 months, requested another PIN, then repeated it after another 3 months. This continued for over a year, then I deleted the new business listings let one month go and again added only 1 listing this time. Again the same procedure. After one and a half year I am yet to get a PIN by post. This is not just my case and nothing related to my bad luck. You can see the same problem with number of other people on their forum. To contact their so called customer care is even more difficult. After a merry go round of getting redirected to \”forums\” and \”help\” you finally MAY land on the page to contact them. The question you ask probably roams around the internet behind their spider/crawler and perhaps does not reach the main place. You never get a reply. I am a new blogger.I need a lot of imformations to make my blog better. how do I improve my blog rank? Thanks for this valuable information. I am very much benefited by this sort of information. Anyone can make his blog or website great by using service provided in this site. Indeed getting registered in Google Places gives you very encouraging results in popularity of the website u own. my website gives me confidence when I notice in Top.